If you look to the right of this post, you'll see what looks like a book cover...and it is! We've learned a lot during the 5+ years we have been RVing. My main purpose in writing this book was to share our experiences and mistakes so that others--new and wannabe RVers--don't have to make the same mistakes. I am sure we will continue to learn as we travel throughout the country, and I will continue to blog. I hope, though that my blogs will finally be able to focus on more adventures instead of the (mis)adventures of the motorhome failing to run properly. One of the links below the book-cover image will give you a sample of the book. The other will take you to the Amazon page, where you can purchase the book. I would appreciate your honest review of the book. I'll keep you posted when the print edition is ready. It would make a fine gift to any of your friends you might be thinking about hitting the RV road. We are finally getting ready to travel! We had planned to take a two- or three-week trip to the west coast of Florida in January, but our plans were sidelined by health issues. Jim developed an outer-ear infection, which became very severe--into a form of osteomyelitis (bacterial bone infection) of an ear bone. It was so bad that the ENT immediately sent him to an infectious disease MD, who put him on 24/7 IV injection drugs. After almost six weeks of antibiotics, the infection was cured. He is now back to normal. At the time when the infection took hold, Jim had discovered (and fixed) a fuel-line problem in Junior. 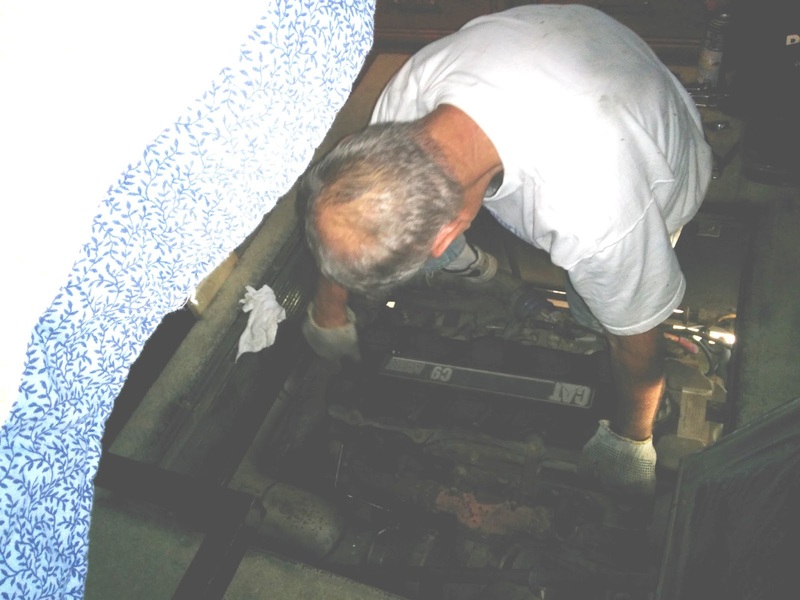 Replacing the leaking coupling was challenging because of the confining space in the engine compartment, but he got it done. However (isn't there always a "however"? ), when he was fixing the fuel line, he found that the exhaust pipe attached to the manifold had rusted out. We could not travel with that known issue. He managed to get the exhaust pipe and its fittings removed and our RV-park neighbor (a welder) welded the new flange for him. But before he could put everything back together, the ear infection sidelined him. Yesterday, he put the exhaust system back together. Yea! We learned an important lesson from this fuel leak/exhaust-system problem: When buying an RV (new or used) examine how to get into the engine compartment. Routine maintenance, such as checking and changing oil and transmission fluids and checking belts, is done through the engine door on the backside of a diesel-pusher RV. 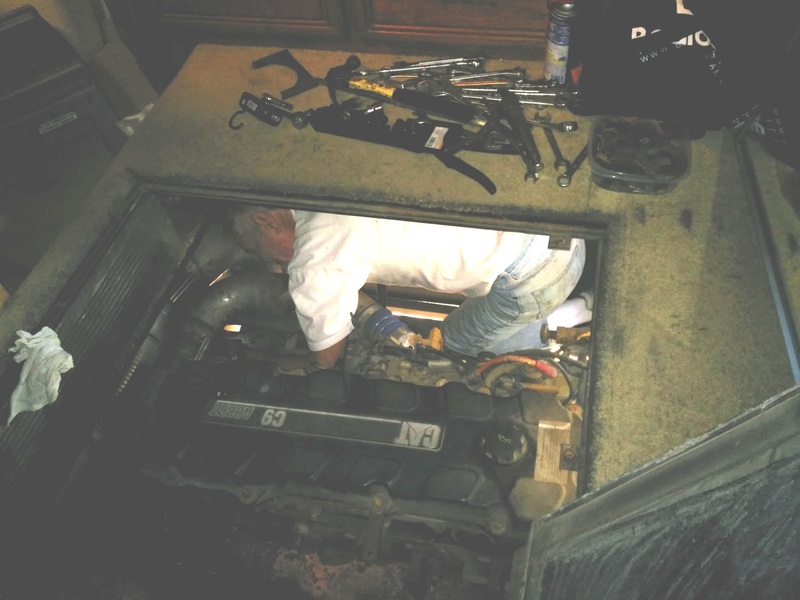 However, to work on the engine requires opening a trap door to the engine compartment, usually found under the bed. We knew where the trap door was in Junior, our 2005 Country Coach. What we did not know (until Jim had to actually work on the engine) was that to open that trap door, he had to remove the mirrored sliding closet doors, unscrew and remove the closet-door track, and prop up the bed before he could unscrew and pry up the trap door. It is apparent that the interior designers did not collaborate with the chassis designers when this model was built. The engine compartment is a tight fit. Jim had to crawl out onto the engine to finish putting the exhaust system together. Crawling out of the engine compartment was in itself a challenge! Visible on the left is the propped-up bed. If we ever buy another RV (I hope not), ease of access to the engine compartment would be on our checklist. With the RV now put back together, where will we go? Our first trip will probably be to Florida's panhandle, where we would like to fish in the gulf, paddle our kayaks down some creeks, and do some fishing.